"Dredd" is a success for the simplest things. This is a film that is as straightforward as it gets. There's no twist or no reward by the time the credits roll. It is just a story of two characters stuck at a 200-story building whose tenants are out to get them and they need to find a way out. Even the acting is simple enough that the main character Judge Dredd gets by with expressions of his chin and his lips. If it sounds amazing that "Dredd" is actually good, then deal with it because it is. It is as simple as it gets. In the future, the only force of order are known as Judges. They act as judge, jury, and executioner by bringing justice right on the spot. Mega-City One is one of the cities in America containing 800 million residents where 17,000 crimes are reported daily. Recently, a new drug, "Slo-Mo", has hit the streets of Mega-City One. The drug slows the user's perception of time to 1% of normal. Judge Dredd (Karl Urban) is tasked on evaluating rookie Judge Cassandra Anderson (Olivia Thirlby), a psychic who has failed the tests as to be a full Judge. While on duty, Dredd and Cassandra respond to a crime at the 200-story slum tower block Peach Trees. The block is controlled by Madeline "Ma-Ma" Madrigal (Lena Headey). Both soon discover that the tower is a drug den and decide that they should act on it. They successfully arrest one of Ma-Ma's henchmen, Kay (Wood Harris). To prevent Kay from testifying against Ma-Ma, she locks down the whole building preventing anyone, even the Judges, from exiting Peach Trees. Now, Dredd and Cassandra must find a way out before Ma-Ma is able to get to them. If we could describe "Dredd", action and gore would probably tell the whole story. But it isn't really. What "Dredd" accomplishes is more than action and gore. It's the whole package of grit, the impressive and creative use of visual effects and the acting of the main cast. Ironically, most impressive is Karl Urban as Dredd. He only uses his voice, lips and chin to do his work as an actor but it was enough to evoke solid emotions. Olivia Thirlby and Lena Headey did awesomely as well. 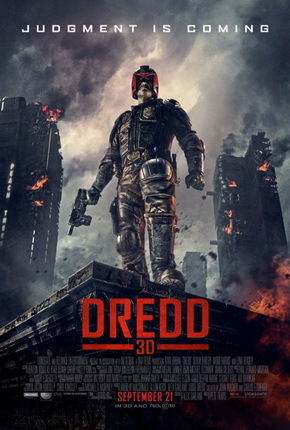 The biggest asset for "Dredd" though is its visual effects especially the "Slo-Mo" scenes. Shot beautifully, it's like watching and episode of "Time Warp" but with guns and gore. Those scenes were not only impressive visually but they also showed creativity. From first person views of free-falling or scenes of people getting shot, these scenes clearly define "Dredd". The plot and the story is simple without any twists and turns along the way. It's just another crime in a city of 800 million. People may not like that there's no overall arc to everything or there's no meaning to what they just saw but it was actually a refresher for us. The only gripe we have is how fast Dredd actually covers the 200-story bulding. One scene his at the ground level and the next he is already at the 75th. There's really no big struggle to go to the final confrontation with Ma-Ma. It's totally unlike "The Raid: Redemption". It could have been better if Judge Dredd actually had a hard time. Overall though, "Dredd" is enjoyable because it's simple enough to be understood without thinking much. It's a visual feast like no other.